First Grade Complete curriculum has it all ready for you. No more searching and combining textbooks to teach different subjects. It’s all included in one binder. This literature-based curriculum provides detailed lesson plans created around thematic units with a biblical worldview. The deluxe bundle includes Teacher's Manuals and Student workbook pages for both semesters, plus seven sets of flashcards, spelling squares, square tiles, tangram patterns, clock with dry erase marker, dice, base ten counting pieces, two bingo games, two memory games, five charts, a twelve-month calendar, student journal, and a one-year spiral-bound planner. "First Grade Complete is thorough, complete, and FUN." The full year bundle includes Teacher's Manuals and Student workbook pages for both semesters, plus four sets of flashcards, spelling squares, square tiles, tangram patterns, dice, clock with dry erase marker, place value chart with base ten counting pieces, a bingo game, a memory game, four charts, student journal, and a twelve-month calendar. 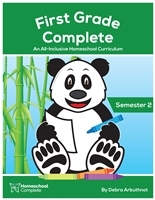 The semester one bundle includes the First Grade Complete Teacher's Manual, Student Workbook, a memory game, bingo game, square tiles, spelling squares, tangram patterns, dice, place value board, base ten counters, three sets of flashcards, two charts, a twelve-month calendar, and a student journal. The semester two bundle includes the First Grade Complete Teacher's Manual, Student Workbook, a memory game, bingo game, square tiles, tangram patterns, clock with dry erase marker, dice, spelling squares, place value board, base ten counters, four sets of flashcards, two charts, a twelve-month calendar, and a student journal. Choose to have a stress-free year with the curriculum that is an open and go program. The teacher’s manual includes the detailed lesson plans for all subject areas and the required student workbook pages. Bound in a sturdy three-ring binder so the pages are easily removable for daily use. Functions also as a portfolio of your child’s work. Have an enjoyable year in effectively teaching your child! The additional student workbook is designed for each additional child using the First Grade Complete curriculum. The teacher’s manual includes the detailed lesson plans for all subject areas and the required student workbook pages.